If you've been beading for awhile, chances are someone has asked you to teach. You might hate the idea, or maybe you're like me–intrigued, but clueless. How do you make that leap from student to teacher? 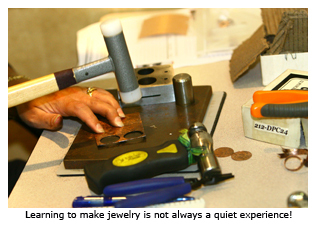 Luckily, the generous instructors at Bead Fest Santa Fe offered to share their tips and advice about teaching jewelry making. Click on the instructors' names in this newsletter to learn more about their backgrounds and current classes. Start small by teaching family, friends, co-workers, and neighbors. Or trying contacting your local bead shop. Over and over, many nationally recognized beading and jewelry making instructors told me how grateful they were to get their start at their own local bead shops. Gail Crosman Moore, for example, raved about how much she learned about the richness that bead shops add to the community when she was invited to teach at Beads and Beyond. 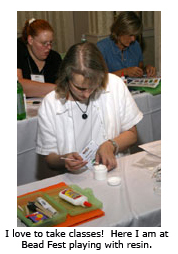 Bead societies or guilds also are another place to start your teaching career. Are you ready to teach at the national level? Karen Keegan, Event Manager for Bead Fest advises, "The class proposals with the best chance of being accepted showcase an original project taught by someone with some previous teaching experience. Also, the photograph that is submitted should be of excellent quality, showing the piece up close, in focus, and with good color. This is the photo that potential students will see to decide if they want to take the class or not." 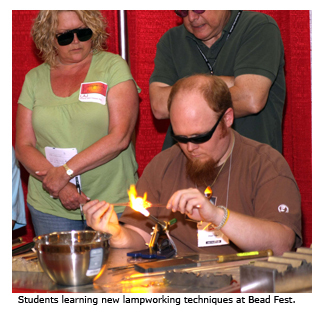 Information about class proposals for Bead Fest's 2010 shows will be available on the Bead Fest website in mid-March. I asked the instructors to share the best teaching advice they ever received–or that they wished they had received. Charlene Abrams: "Before my first ever class, I wish I'd known just how much the finish on seed beads affect the ability of a newbie to see what's going on. Now I suggest to less advanced beaders that they steer clear of iridescent transparent beads, and choose high contrast colors when learning a new technique." Janice Berkebile: "The project needs to have intrigue, to get interest in the class. Keep projects simple though. Getting a project done in class leaves students feeling very satisfied. My propensity is to overdo things. Teaching for me is a lesson to keep it simple!" Joan Babcock: "Communication and preparation are key. Everyone should be working on the same project. Too many choices (colors, sizes, etc.) can make it confusing and take up valuable class time." Sally Stevens: "The best advice I ever got was 'to give your all' to your students and not to hold anything back. It can be threatening to share all that you have learned over the years but I have found that the rewards have been astounding." Dale "Cougar" Armstrong: "Sometimes people choose a class by looking at the picture and disregard the skill levels, so an instructor has to be ready to teach the specified project to anyone, regardless of the advertised skill level. Therefore, teach projects you can make in your sleep!" Melinda Barta: "If you are new to teaching, learn from the best and volunteer as a teacher’s assistant. Even if you’ve been teaching for years, don’t forget the value of being a student and take a class once a year. Seeing a true teaching pro in action is priceless, plus you’ll make some great connections." Judy Walker: "I've learned a lot from wonderful teachers. More than just the class projects, I learned about teaching methods, how to write effective instructions, and visual aids. And I've learned to let go of perfectionism. Perfection is something you approach, not something you ever achieve. Learn to find the satisfaction in that." Tina Koyama: "When I first started beading, I took a class from Nancy Eha and learned by example what a good beading instructor does. She used illustrations, well-written instructions, orally spoken instructions, demonstrations, scribbles on the board, one-on- one and group discussions. In short, she used every method possible to explain the steps. It made me realize that different students need different teaching methods, so the same information has to be presented in as many different ways as possible." Enthusiastic, hard-working, enterprising students keep many instructors motivated to continue teaching. As Maggie Meister said, "I am grateful for the input from students and watching them interpret my designs to make them their own." And then there are the students who touch your heart. Larkin Jean Van Horn shared this story: "I've had a number of mother/daughter teams sign up for my classes, but the most memorable was the woman in the early stages of Alzheimer's who was there with her daughter. The daughter professed to have no interest in beading and was only there to help her mother get through the class. At the end of the day, the mother, who had stayed clear and untroubled all day, told me proudly that between us we had made the daughter a convert, and she would be doing a lot of beading from then on. The daughter wanted advice on what other classes she could sign up for. That was a win/win/win day if ever there was one!" Michelle Mach shares beading news, contests, reader galleries, and other beady stuff every Monday on Beading Daily. If you have comments or questions for Michelle, please post them on the website.